“I can’t believe we’re finally here.” Joe says as I unload gear from The AquaMarie, and begin to pitch camp. Just as children eagerly await the annual return of the man in the Red Sled, Joe and I dream all year of this trip. Our annual return to Forked Lake did not disappoint us in any way, living up to its legends. 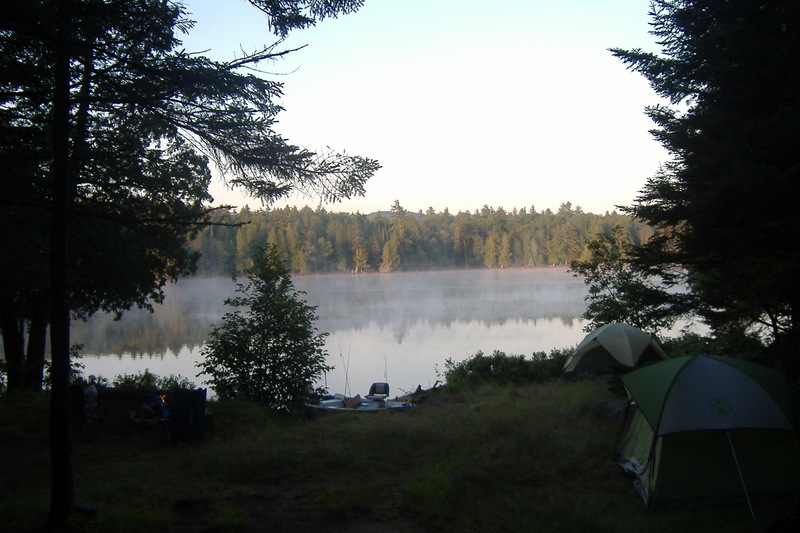 A beautiful, crystal-clear glacial lake, great fishing with big smallmouth and largemouth bass, the solitude and quiet of the High Peaks Region. A bit of change in personnel this year added new variety. With a six-month-old baby, a two-year-old and their eight-year old daughter at home, my son Ryan had to be excused from the camping trip this year, a sacrifice to domestic service. This has become a father & son tradition over the last four or five years, and Ryan was somewhat disappointed and apologetic about being unable to attend. Joe was concerned that we didn’t have Chef Ryan (who studied and considered culinary arts before becoming a nurse) or his recipe for fresh bass. I assured Joe that I knew the recipe, and was confident we’d be able to cook fish on our own. New faces this year as our friends Greg (another guy we work with), and Irv (a guy that previously worked with us) signed up for the adventure. Along with guests in camp Saturday night, it was an action-packed and fun-filled weekend living up to its promise. This year we reserved 3 campsites side-by-side, as we have in the past. Sparky was at site 8, Joe at 9, and I was at 10 with Greg. When Irv arrived Saturday, he managed to get site 7. 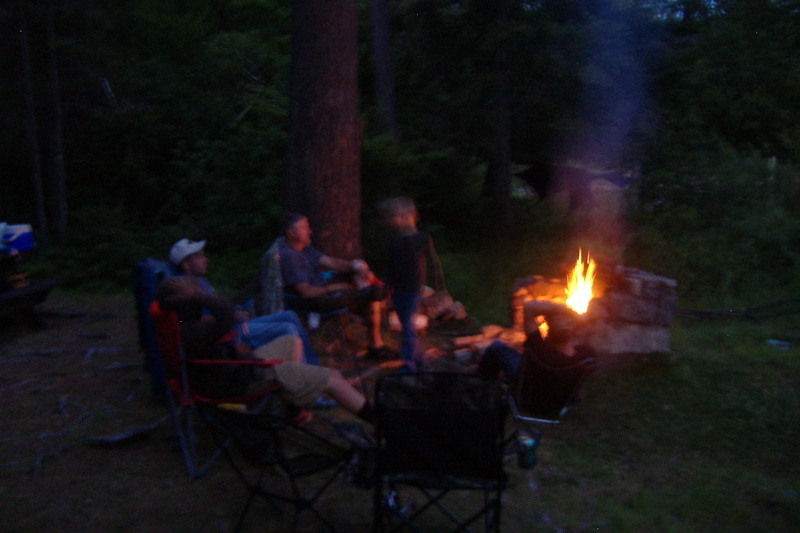 Weather was perfect for sleeping in tents, fishing all day, and gathering around a fire in the evening. Certainly it was a high point for the mosquitoes. We should be glad they’re doing so well, and in no danger of being placed on a threatened species list. Friday reports from Joe and Bowin held that the fishing bounty was a bit off this year. 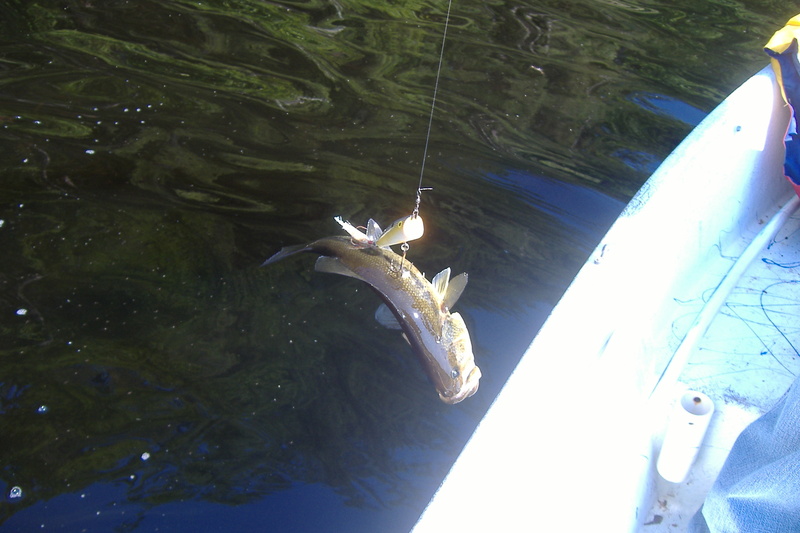 Tried-and-true hot spots produced no action, and the few scattered takers were of modest size, some the legal minimum. Having arrived at noon and tasked with pitching camp, I had but a couple short hours in the late afternoon to put into plying the waters for our unseen quarry. My results brought a poor trend down further, as I landed nothing. Sparky and Greg arrived late in the day, having worked the Friday and hurriedly packed to flee the mayhem of modernity and make their way to the quiet piney north woods. There was more than enough food and beverage to feed the six of us Friday night. As always, something about the outdoors and fresh, open air served to enhance the taste and satisfaction of the meal of delicious venison sausage. All-the-more fitting, the meat stuffs were the product of previous woodland adventures, the harvest of Joe’s hunting season. Joe’s wife and second son Luke were scheduled to visit the Blue Mountain Lake Museum with some other family members on Saturday, bringing them within 12 miles of Long Lake and the Forked Lake Campground. After their excursion, they planned to join us in camp for a shore dinner of the bass of which we rave, and the most scenic of places to catch and eat it. The water was calm, smooth as glass, and Greg’s top-water lure got frequent strikes, but they proved to be sunfish, pumpkinseed and small bass. Greg tried his patented grappling method a couple of times with good result, presumably he was becoming concerned with eating today, and was willing to take whatever he could. “I’ve never felt pressure to fish before.” I told Joe as we tried to determine what quantity of fish we’d need for a big shore dinner with company. Next time: Fabulous Shore Dinner, and more thoughts from the piney woods.